Two of Hallie’s favorite things are craft projects and school. When her teacher sends home assignments that require her to be crafty she is over the moon excited. Of course the minute she walks through the door she wants to work on it. Knowing the assignment isn’t due for some time I push her off. 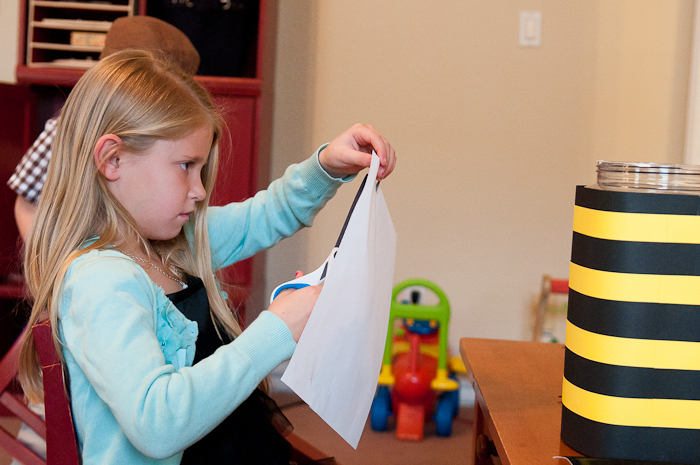 Multiple times a day she talks about the project, “Can we start it now?” I had pushed her off long enough and she started coming home telling me about all the projects that had already been returned to the school…It was time, we finally crafted her Valentine’s box. 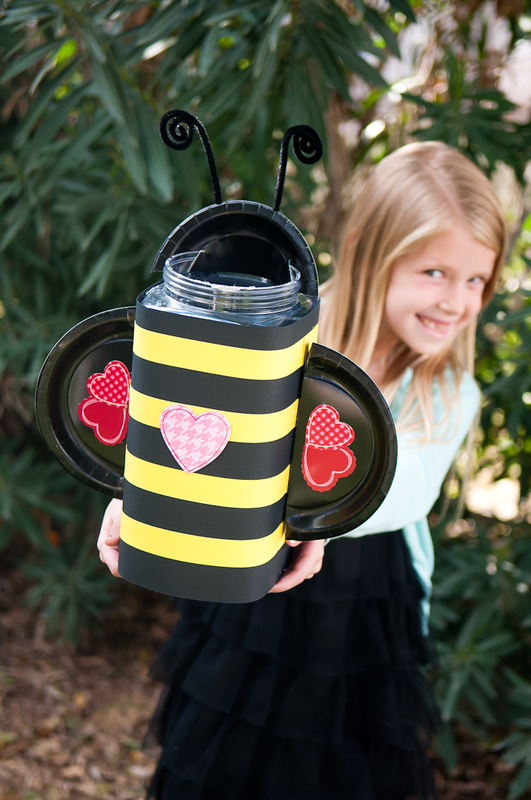 We looked through different sized boxes and had a couple ideas, but when I came across the peanut butter pretzel tub from Costco a light clicked on; we could make a butterfly or a bird or a bee or a bug and use the canister as the body. 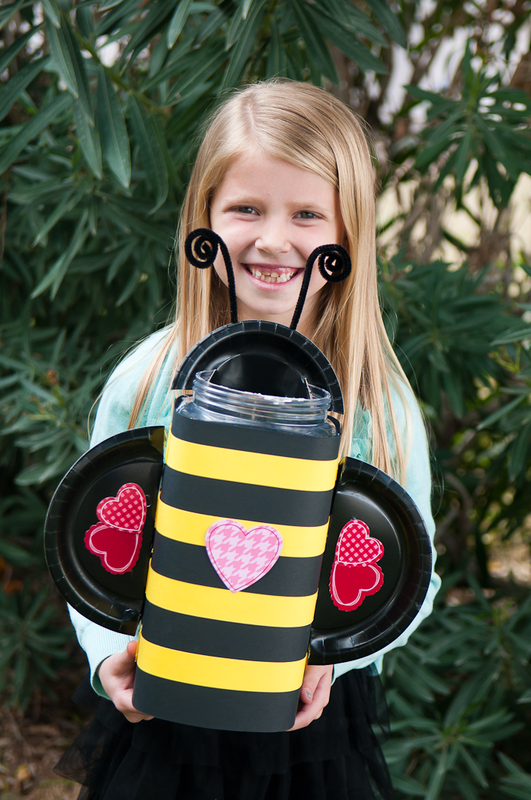 Hallie was convinced the bee was the way to go and we started crafting. I taught her out to use the straight edge cutter (the tool I never let her use before!) 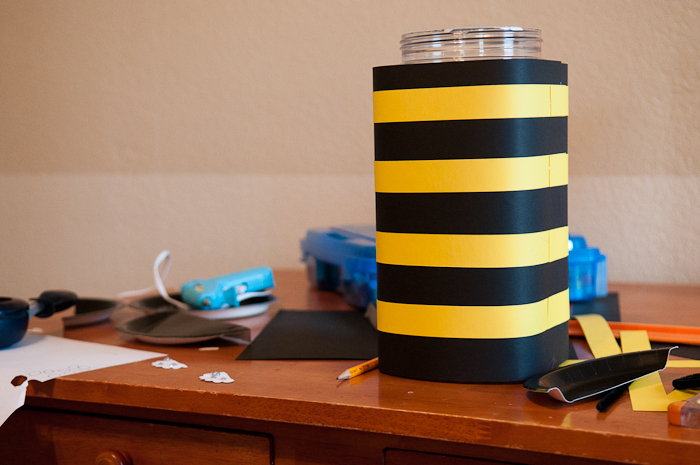 to cut the yellow stripes and even taught her how to use a glue gun. I would draw pencil lines on the paper and she would carefully cover the lines with the glue. She tried several different designs on the wings but decided the valentine stickers were the way to go. After almost two hours of paper, glue and scissors we finally finished. A minute later she was asking if we could make the Valentine’s for her classmates. I pushed her off – we don’t have to turn those things in until Thursday! !